NEWARK, NJ (July 28, 2014) – SOUTHEASTERN UNIVERSITY'S BROADCAST MAJORS PRODUCE NATIONALLY TELEVISED TALK SHOW WITH PANASONIC AK-HC3800 HD STUDIO CAMERAS: Southeastern University, a private Christian institution with more than 4,000 students located in Lakeland, FL, trains its broadcast majors in a sophisticated HD production studio equipped with four AK-AC3800 studio cameras. 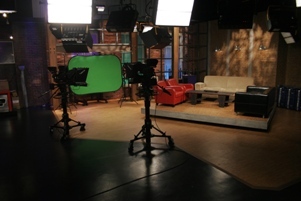 Students at all levels, freshman through senior, have hands-on access to the HC3800--one of the industry's most advanced studio models--which they use not only for classroom work but also to produce RAW TV, a nationally televised talk show. RAW (Real and Willing) TV is a student-produced show that combines musical guests, comedy, interviews and panel discussions. Shot live-to-tape, the 30-minute show airs weekly on DIRECTV channel 378 via the NRB Network, and is also available from iTunes. Fritzsche noted that each of the HC3800s is outfitted with Panasonic's AK-HVF70 seven-inch electronic viewfinder, equipped with a "Focus in Red" function that highlights the edges of an object in red. “This focus assist is especially valuable for students who, 20 minutes ago, may never have heard of pulling focus,” he said. Fritzsche explained that during Bush Chapel events, which include services, classes, rehearsals, concerts and the university's annual National Leadership Forum, the HC3800s send live video feeds for IMAG on the space's two side screens. Bush Chapel is equipped with six high-powered Panasonic PT-DZ870U projectors, four of them with the ET-DLE030 ultra-short throw lens, to create a center blended, 100-inch image from only 2.7-feet away. Fritzsche added that the HC3800s were also used to produce a video blog for the university's president. “We are proud that in upwards of 95% of campus video production, our cameras are student-operated,” he added, “Using professional-grade equipment like the HC3800s gives our students an edge because they leave here with plenty of experience using the same caliber equipment that they'll encounter on the job.” For more information about Southeastern University, visit www.seu.edu. The AK-HC3800 is an HD studio camera equipped with three high-sensitivity, high-quality 2/3-type 2.2-megapixel CCDs, a high-precision 16 bit A/D image processing circuit, and the latest generation 38-bit Digital Signal Processor (DSP). Compact and lightweight at only 8 lbs, it offers chromatic aberration compensation (CAC), scene file settings, and a sophisticated implementation of Panasonic's exclusive dynamic range stretch (DRS). The HC3800 achieves a high sensitivity of F11 at 59.94Hz (2,000 lx) and an S/N ratio of 60dB. The 16-bit A/D and 38-bit DSP utilize Spatial Offset Technology, and an advanced single transfer system to provide a high resolution picture (1,100 lines) with less moiré and a vertical smear level less than -130dB. For more information on Panasonic professional video products, visit www.panasonic.com/broadcast. Panasonic delivers reliable business technology solutions that connect data with decision makers to drive better outcomes—for our customers and our customers' customers. Panasonic engineers reliable products and solutions that help to create, capture and deliver data of all types, where, when and how it is needed. The complete suite of Panasonic professional solutions for government and commercial enterprises of all sizes addresses unified business communications, mobile computing, security and surveillance, retail point-of-sale, office productivity, visual communications (projectors, displays, digital signage) and HD video production. Panasonic solutions for business are delivered by Panasonic System Communications Company of North America, Division of Panasonic Corporation of North America, the principal North American subsidiary of Panasonic Corporation. All brand and company/product names are trademarks or registered trademarks of the respective companies. All specifications are subject to change without notice. Information on Panasonic solutions for business can be obtained by calling 877-803-8492 or at us.panasonic.com/business-solutions. Panasonic Corporation of North America provides a broad line of digital and other electronics products and solutions for consumer, business and industrial use. The company is the principal North American subsidiary of Osaka, Japan-based Panasonic Corporation and the hub of Panasonic's U.S. branding, marketing, sales, service and R&D operations. In Interbrand's 2014 annual “Best Global Green Brands” report, Panasonic ranked number five overall and the top electronics brand in the report. As part of continuing sustainability efforts, Panasonic Corporation of North America relocated its headquarters to a new facility, built to meet LEED certification standards, adjacent to Newark Penn Station in Newark, NJ. Learn more about Panasonic at www.panasonic.com.